Originally published by O. L. Baskin & Co., 1883. This is a 1978 reprint by Unigraphic, Inc.
Cover has light wear; inside pages are clean; outside page edges of closed book are very slightly soiled. 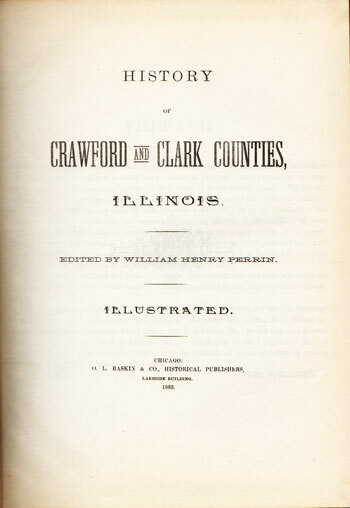 A detailed history of Crawford and Clark Counties, Illinois from their first settlement and continuing to 1883. Also includes many family biographies for both counties. Hard cover, 858 pages, includes an index to names.